Ontario Premier Kathleen Wynne recently concluded her trade mission (February 1 – 5, 2016) in India. Premier Wynne signed Memoranda of Understanding (MOUs) with five Indian states during the mission. These agreements will make it easier for the regions to work together in areas of mutual interest. Ontario-based Novo Plastics announced it will start the production and sale of the world’s first plastic exhaust system in India. This ground-breaking technology was made with support from the Ontario Innovation Demonstration Fund. Seneca College and the Max Institute of Health and Education and Research will partner to train 3,500 medical sales graduates. India’s Life Sciences Sector Skills Development Council identified the need for 20,000 trained medical sales representatives. National Skills Development Corporation and five Ontario colleges launched a joint initiative that is aimed at enhancing training programs to Canadian and international standards while strengthening educational and economic ties between Ontario and India. The Ontario Ministry of Research and Innovation will invest $900,000 to support three strategic, bilateral research collaborations under the Ontario-India Research Collaboration Fund, to support researchers from Ontario and India who are involved in developing new anti-malarial treatments, new water purification technologies and a community energy storage system. This funding will be matched by India’s Department of Science and Technology and Department of Biotechnology. The Premier delivered a keynote address on the economic benefits of fighting climate change to several hundred Indian business leaders and innovators at the Economic Times Global Business Summit. 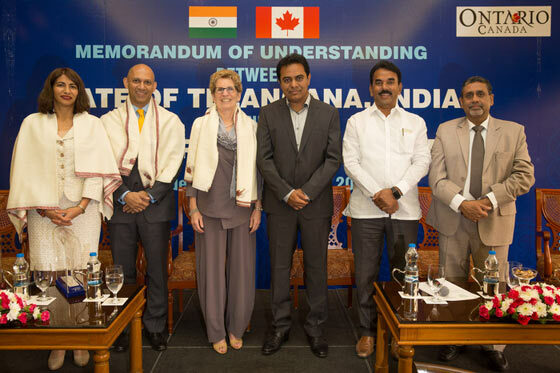 While in New Delhi, Premier Wynne signed Ontario’s first MOU with the state of Andhra Pradesh. This agreement will make it easier for the two regions to share knowledge about climate change and will support economic cooperation through joint activities such as seminars, trade missions and conferences. The Premier also participated in a panel with female parliamentarians from Afghanistan, India, Nepal, Pakistan and Sri Lanka on empowering women through skills development and economic independence. Unique Broadband Systems Limited and Astra Microwave Products Limited established a joint venture to provide broadcasting services, satellite uplinking and medical imaging products to India and other regional markets. DataWind signed a Memorandum of Understanding (MOU) with the Government of Telangana to open a manufacturing base in Hyderabad, which is expected to be in production within months. Solantro and Smarttrak announced that they will collaborate on the development of electric power solutions, renewable energy and micro inverters. Kinectrics and Nuclear Fuel Complex signed an MOU for an advanced partnership in nuclear energy initiatives. McMaster University signed a Research Partnership Agreement with the Indian Institute of Technology (IIT) – Hyderabad, which will generate opportunities to create intellectual property through innovation and to commercialize research outcomes. India and Ontario have an excellent track record of collaboration in the automotive sector and continue to grow partnerships in automotive trade, innovation and investment. For example, India’s Tech Mahindra is piloting its Intelligent Electric Vehicle Charging technology in Niagara-on-the-Lake, Ontario. The company selected Ontario because of its leadership in Smart Grid and renewable energy technologies. Ontario is the first Canadian province to allow on-road testing of automated vehicles and is home to almost 100 companies and institutions involved in connected vehicle and automated vehicle technologies. Several agreements are valued at over $240 million and will create more than 150 high-value jobs in Ontario. 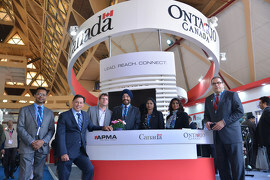 Ontario and the State of Maharashtra signed a MOU that will focus on strengthening connections in key commercial areas, including urban infrastructure, information and communications technology, advanced manufacturing, agriculture and education. eCAMION, Ryerson University Centre for Urban Energy and L&T Technology Services will work with the Tamil Nadu Generation and Distribution Corporation and Anna University-Ryerson University Urban Energy Centre to launch India’s first community energy storage system at Anna University on the Tamil Nadu state grid. With the goal of providing customers with safe and healthy drinking water through cutting-edge technologies and customized water solutions, Process Research ORTECH (PRO), a Mississauga-based company that incubates and commercializes innovative technologies for process industries, signed a $10-million MOU to form a strategic partnership with Eureka Forbes, India’s leading health and hygiene company. Through this collaboration, the companies will leverage their core competencies and skills to introduce a unique and innovative technology with Automated Variable Filtration (AVF), a high-quality water filtration system, to India. Seneca College and College of Engineering Pune announced that they will launch an innovative project competition in the area of health care through Seneca’s incubator HELIX (Health Entrepreneurship and Lifestyle Innovation Xchange). This tri-party MOU, also with the City of Markham, will promote global entrepreneurship among young entrepreneurs from India and Ontario. McMaster University and Indian Institute of Technology – Bombay announced that they will work together on new collaborative research initiatives and training models. Key areas are automotive research, materials and biotechnology. The City of Toronto and the Maharashtra Film Stage and Cultural Development Corporation signed a Memorandum of Understanding to work together on common interests in the creative screen industries, including studio production, post-production, visual effects and interactive/digital media. The Toronto International Film Festival (TIFF) and the Mumbai Academy of Moving Image (MAMI) highlighted their collaboration on a boot camp to help Indian filmmakers bring their work to international film festivals. These new partnerships will enhance the relationship between Ontario and India’s film industries and pave the way for more collaboration between producers, directors and artists from both regions. The provincial budget for cultural media tax credits will increase from $399.7 million in 2014–15 to nearly $440 million in 2015–16. The Premier also met with representatives from several Indian companies — including ICICI Bank, Mahindra Group and the Tata Group — to promote Ontario as an ideal place to invest, and participated in a financial services roundtable held by the Canada-India Business Council. The Premier attended a Bollywood-style film event in Mumbai, where she met with leaders from India’s film industry to promote Ontario as an ideal location for future productions. Attracting new investment and helping the province’s businesses compete globally is part of the government’s plan to build Ontario up and deliver on its number-one priority to grow the economy and create jobs. The four-part plan is investing in people’s talents and skills, making the largest investment in public infrastructure in Ontario’s history, creating a dynamic, innovative environment where business thrives, and building a secure retirement savings plan.